It all began in 1963 when a proposal for a new jet trainer was made involving three different designs. The Polish PZL-11 “Iskra”, the Soviet Yak-30 and the Czech L-29 Delfin. It was decided by the “powers that be” that the L-29 would be the future trainer jet for all Warsaw Pact countries. Interestingly enough, Poland still ended up using the “Iskra” which is still in service today under the designation TS-11. Since the L-29 ended up the winner, mass production and deliveries soon began. They began to arrive in Bulgaria in the summer of 1964 and were immediately transferred to Kamenetz airbase, where the command staff of instructors of the 2nd aviation training regiment began to use the new aircraft with the assistance of Soviet instructors. 6 L-29s were delivered by the end of that year with the first with construction number № 491028 and bord number “11” delivered on July 21, 1964. The initial entry into service was with high intensity but went very smooth. On one hand this was due to the excellent preparation of the Bulgarian pilots, having long experience of the relatively sophisticated fighter jets MiG-15 and MiG-17, but another reason was the excellent qualities of the new plane. At the same time the flying school at Dolna Mitropoliya started preparing to be the main airbase that will be operating the L-29. Freshman cadets in 1964 began receiving training to prepare for the new aircraft. This is the first class in the country which began initial study of the L-29. The first flights with cadet pilots using the L-29 began in May 1965 by which time the number of aircraft received increased by another 12 machines. Intensive flights ran from June to October during which time students began to fly alone and perform complex aerobatics. The experience gained after these relatively few hours allowed cadets to begin flying the MiG-15 and MiG-17 in Kamenetz. This first graduating class (class of 1968) is unique in the fact that it was the first class to start training on the L-29. During that time all pilots completed the program successfully with no accidents or crashes and had an average of over 300 flight hours. Eight of the pilots remained to continue their service as instructors of the new aircraft. 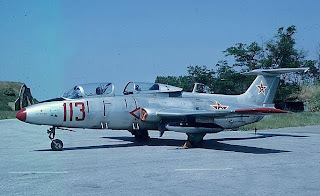 By this time in 1968 the total number of L-29s in Bulgarian service is 52. The next class marks milestone of L-29 operations in Bulgaria. Cadets underwent theoretical training at Shtraklevo airbase and flight training at Dolna Mitropoliya airbase where they performed flights simulating attack of air targets which is the first time this has been done. By 1970 the total number of L-29s had reached 82 with 2 squadrons of L-29s at Shtraklevo and another 2 squadrons at Dolna Mitropoliya. As supplies of the Czechoslovak trainer increased this required a greater quantity of instructors and 38 of the 44 pilots of the class of 1970 remained as instructors. This class was the first to perform flights at night in simple weather conditions. At the same time the installation of the first TL-29 simulator was completed at Dolna Mitropoliya airport. The L-29 continued proving itself as an excellent and reliable trainer which provided opportunities for the preparation of cadet pilots for more complex tasks. 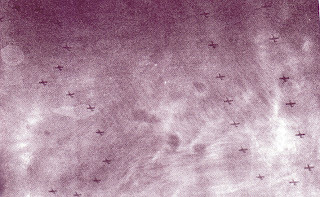 During the winter of 1971-1972 cadets successfully completed a program involving flying in complicated meteorological conditions (cloud lower limit of 300m(900ft) and visibility 3 km). Additional training was completed in conducting aerial reconnaissance and ground target training using unguided rockets and bombs. This now allowed the L-29s to be used in actual armed conflict, if need be. To increase firing capabilities, attempts were made to mount a 7.62mm machine gun in the bow of the aircraft. The experiment was successful and one L-29 had such weapons, serving for many years for practicing shooting at ground targets. 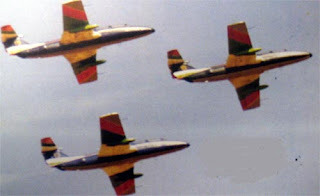 The L-29 fleet was extensively and effectively demonstrated several times on special occasions. The biggest of these was the flight of 63 L-29s in formation on September 9, 1974 during a military parade in Sofia where the party and state leaders watched. 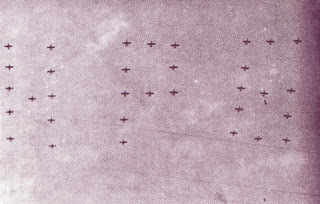 The planes in formation spelled out “30 НРБ”. This stood for 30 NRB or 30 Narodna Republika Bulgaria (People's Republic of Bulgaria). The celebration was the 30th anniversary of the establishment of the Bulgarian Communist party. In a perfect array, 63 L-29s at a speed of 350 km /h and altitude of 1200m passed over the city center becoming one of the largest shows of Bulgarian air power and putting to shame any formation put on by the Blue Angels. Several other similar formations were done during the years including one which showed "25" instead of "30" on September 9, 1969 but without the "NRB" letters. The curriculum remained unchanged until 1988 which meant that cadets received about 100-200 hours in the L-29 upon graduation. Additionally the flying school “G.Benkovski” at Dolna Mitropoliya began training pilots for the needs of civil aviation, which also received their initial training of 50 hours on L-29s. Between 1977 and 1995 270 civilian pilots were trained that went on to fly in the national airline “Balkan”. Also between 1979 to 1984, 13 Vietnamese and 18 Nicaraguan pilots were trained on Bulgarian L-29s. L-29s served until they were retired on June 11, 2001 ending an almost 40 year history with the Bulgarian air force. 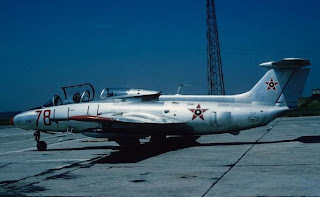 In the 1990s L-29s were dispersed to various airbases besides Shtraklevo and Dolna Mitropoliya. Shtraklevo itself was closed in 1998. Some of these airbases included Balchik, Ravnetz and Dobroslavtzi. During the period between 1964 to 2001 a total of 109 L-29s were delivered with consecutive bord numbers from “11” to “119”. The aircraft had an average of 4000 hours each. The L-29 was extremely reliable and easy to fly as shown by the good safety record. Only 4 airframes were lost during 37 years of extensive operations. The first serious incident was on November 18, 1971. While trying to perform a routine reconnaissance training flight the aircraft descended below the minimum allowed altitude and crashed with the death of both pilots. For the same reason, two instructors were killed on June 14, 1972. One of them is lieutenant Chavdar Djurov the son of the minister of defense. On August 4, 1974 during a formation flight an L-29 piloted by sergeant Stefan Stefanov hit the lead plane. Instead of ejecting, he attempted to fly despite the resulting damage and crashed. In 1979, 1982 and in 1983 there were three registered cases of in- flight engine compressor destruction. In the first case, the debris of the destroyed engine cut the engine controls after take-off at a height of 6 meters and the plane collapsed on the runway breaking in two and catching fire but the pilots were saved. In the latter two cases, the altitude was considerably higher and the pilots used the excellent aircraft aerodynamics to glide to an emergency landing. After retirement, many aircraft ended up being sold to foreign private operators as is the case with many L-29s at Lancaster. Some L-29s became preserved throughout Bulgaria one of them being the first L-29 delivered. Bord 11 can now be seen preserved at the air force museum at Plovdiv airport. Other L-29s have an unknown fate but were probably scrapped. More pictures L29's at Lancaster are being added to the Cold War Air Museum web site. The first flights with cadet pilots using the L-29 began in May 1965 by which time the number of aircraft received increased by another 12 machines. Intensive flights ran from June to October during which time students began to fly alone and perform complex aerobatics.